Not that long ago, I made homemade pizza sauce from home-grown tomatoes and mentioned that it can either be used right away or stored for later by freezing. I wanted to elaborate a bit on what I did. 2. You could use a pressure cooker to preserve the left-over pizza sauce. However, if you are like me, you may have a pressure cooker somewhere, but have no idea how to use it. Or you may not even have a pressure cooker. So instead of using a pressure cooker, the pizza sauce can be stored by freezing it. 3. After making the sauce, allow it to cool to room temperature. Once cooled, fill the sauce into ice-cube trays. Make sure to not overfill the trays. Why would anybody freeze pizza sauce in an ice-cube tray instead of a freezer bag or storage container? 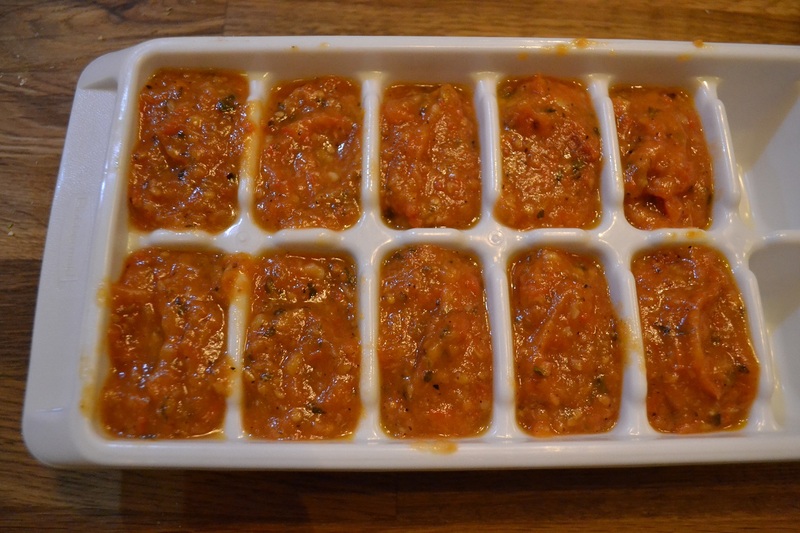 Because freezing the sauce in the ice-cube tray, allows you to defrost small portions at a time, rather than defrosting the whole batch all at once. 4. Place the ice-cube tray in the freezer overnight. 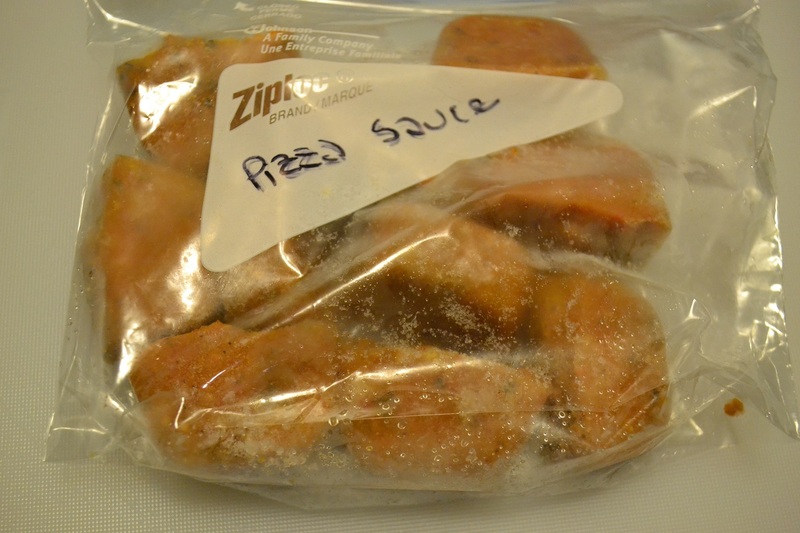 The next day, remove the frozen pizza sauce cubes and place them in a labeled freezer bag or storage container. You do not want to get confused what these cubes are later, especially if you start freezing other things in portions like this–unless you like surprises. 5. Whenever, you want to make pizza, just take the required number of cubes out of the freezer. Thaw and use on your pizza. Categories: In The Kitchen, Useful Ideas | Tags: freezing, home-made pizza sauce, storage | Permalink.